A failed meeting in Astana highlights the limits of Nazarbayev’s efforts to bring Russia and Ukraine together. On Thursday morning, the airport in Astana was not teeming with European diplomats, as Kazakhstan’s President Nursultan Nazarbayev had expected only a week ago. The “Normandy-style” meeting to help find a resolution to the Ukraine crisis that should have taken place on January 15 was called off as little progress has been made between the Russian and Ukrainian foreign ministries in recent weeks. The local press in Kazakhstan was saturated with references to Normandy, alluding to the first meeting between Vladimir Putin and Petro Poroshenko on the northern shores of France last June during a World War II remembrance ceremony. The presidents of Russia and Ukraine have since spoken on a handful of occasions, between promising steps forward and disappointing setbacks. Nazarbayev traveled to Ukraine in December to conduct private talks with Ukrainian leaders, just before the Eurasian summit in Moscow. The Central Asian leader was indirectly and symbolically making a statement about the difficult balance his country has to maintain between Kiev and Moscow. The guiding principle of a multi-vector foreign policy has been present in Kazakhstan since independence in 1991. 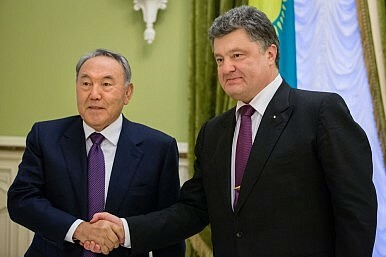 In Ukraine, Nazarbayev continued the tradition, offering unhindered political and commercial cooperation to his Ukrainian counterparts. From Kiev, Poroshenko closed the year 2014 announcing that the following “diplomatic year will start in Astana on January 15,” welcoming Nazarbayev’s invite. The original “Normandy” meeting was brokered by German chancellor Angela Merkel and French president Françoise Hollande. Various European leaders weighed in over the following months with their own attempts to bring Putin and Poroshenko together. Most recently, the four leaders met in Berlin on January 5. Nazarbayev seized the occasion to fly to Germany and publicly reiterate Astana’s readiness to be the next venue for the talks. In the following days, however, hope withered as diplomatic exchanges failed to show any sign of progress. Hollande publicly voiced his discomfort with the recent developments and the meeting was ultimately called off on January 12. Diplomacy continues at lower levels among the four countries that make up the “Normandy quartet.” Oddly, Kazakhstan is not one of them. Nazarbayev is in fact trying to be the broker in a negotiation that is quite out of his reach. Multi-vectorism has opened the door for several extravagant choices for Kazakhstan. From the commitment to fighting the spread of Ebola in West Africa to the signing of the Antarctic Treaty in November 2014, Nazarbayev has gone out of his way to establish his country as a reliable player in the international arena. This time, he has tried to address a thorny problem that indirectly affects his country. Notably, Kazakhstan has been the target of several revanchist declarations from political and cultural figures in Russia, due to the established presence of ethnic Russians, especially in the north of the country. The violence in Kiev, separatist troops in Eastern Ukraine, and last year’s referendum in Crimea are all part of a painful headache for Astana. The meeting in Kazakhstan was postponed indefinitely, but European diplomacies are confident that it can still take place in the next weeks, should the situation improve. Nazarbayev will thus sit in the stands and wait for Putin and Poroshenko to reach common ground, while France and Germany actively try to draw the two sides together. It appears that Nazarbayev will have to continue to occupy the uncomfortable position of “outside broker” – with the risk of irrelevance. Kazakhstan’s president has been a fixture on television in recent weeks. What message is he sending?